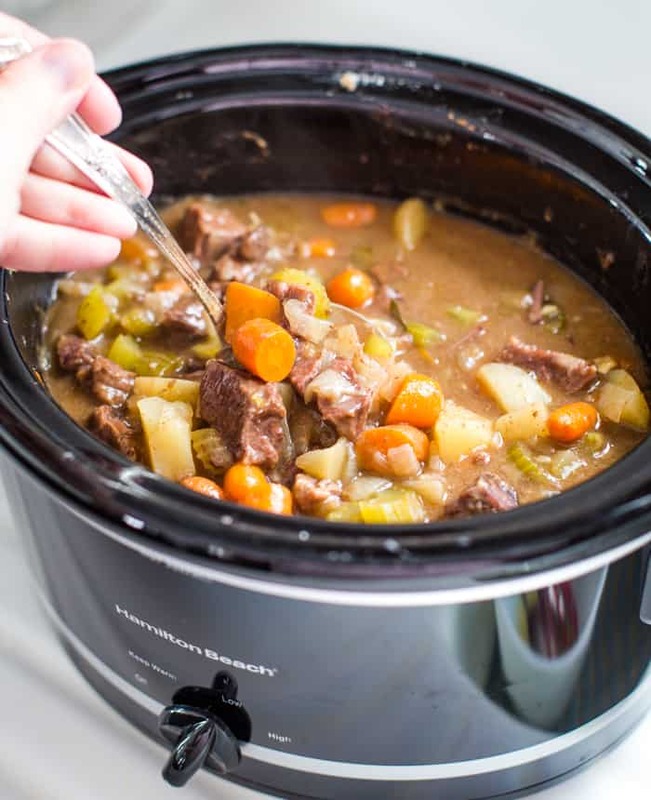 This slow cooker beef stew is rich in flavor! 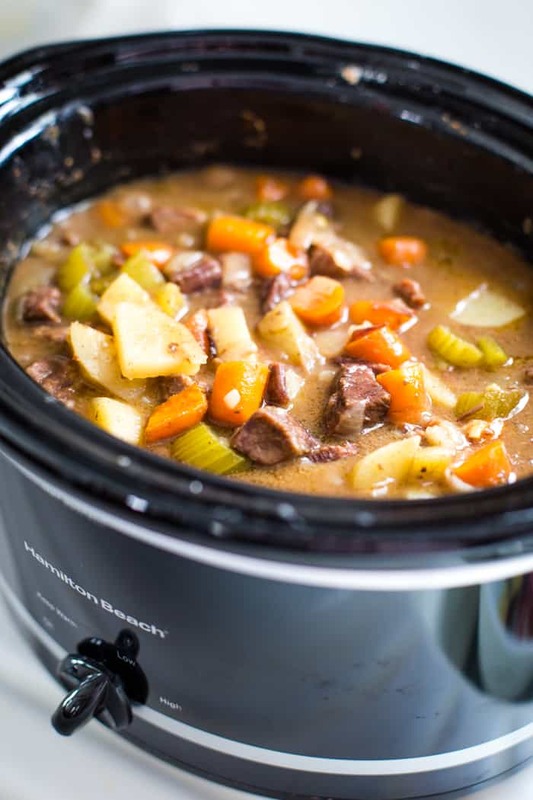 The tender beef is simmered for hours with carrots, potatoes, onions and celery to create a thick and tasty beef stew for a cold winter evening. Now that the polar vortex is over, let me share with you how we survived. 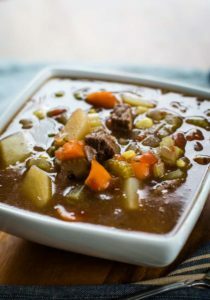 This hearty beef stew! 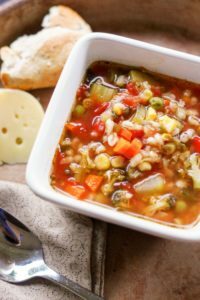 I made this stew multiple times because of it’s rich flavor. 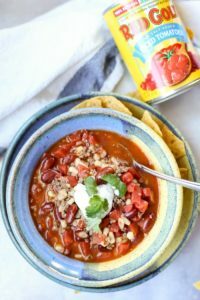 In all honesty, my favorite part is that I could throw it all in the slow cooker and deliver a delicious HOT dinner in the evening. Key word: hot. It’s a one dirty dish meal. No browning the beef needed. (That is, unless you just can’t help yourself.) 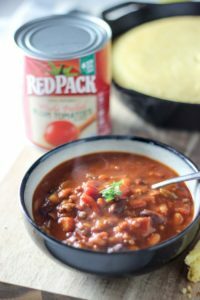 Because of the combination of spices you get the full flavor with little effort and less pans to clean since you only need your slow cooker. It’s thick. Like, really thick. Unlike this vegetable beef soup it has a thick beefy broth. 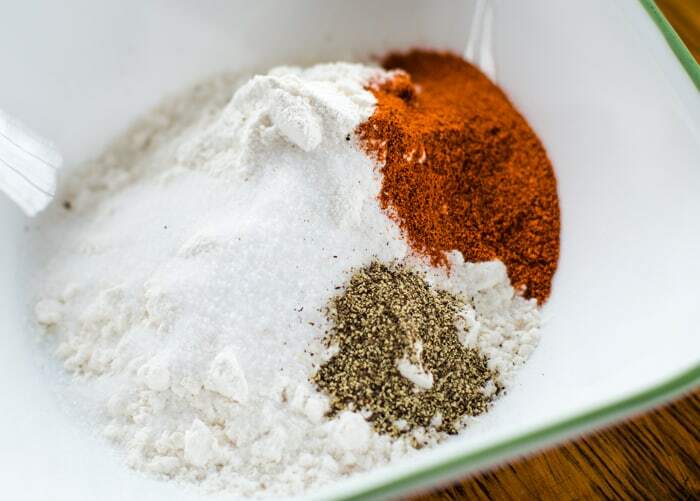 The flour encloses the beef before all the rest of the ingredients are added and creates the flavorful and hearty thick beef broth after hours of cook time. Did I mention easy? Throw it in there and let it go all. day. long. Step 1: Combine the flour, salt and Hungarian paprika in a bowl. I use Hungarian paprika instead of regular because I think it carries more flavor. I found mine at a bulk food store. If you only have regular on hand, that will work too. However, I highly recommend getting the Hungarian the next time you find it. 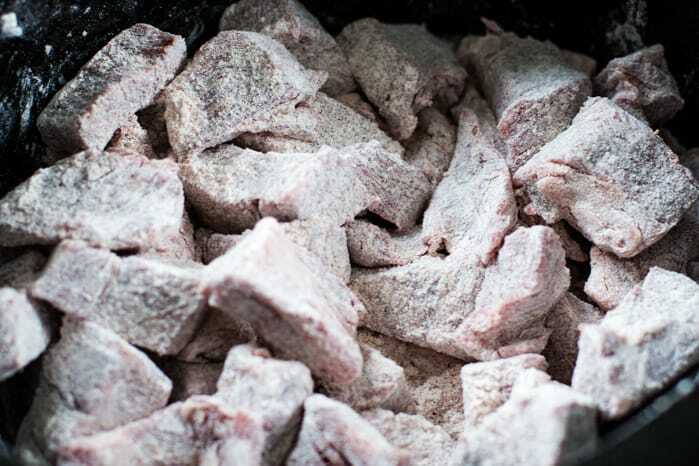 Step 2: Place the cubed chuck roast (or your favorite stew meat) in the slow cooker and toss it with the flour mixture making sure to fully coat each every single piece of beef. Step 3: Add the remaining ingredients. Easy, right? Step 4: Give it a good stir to mix well. 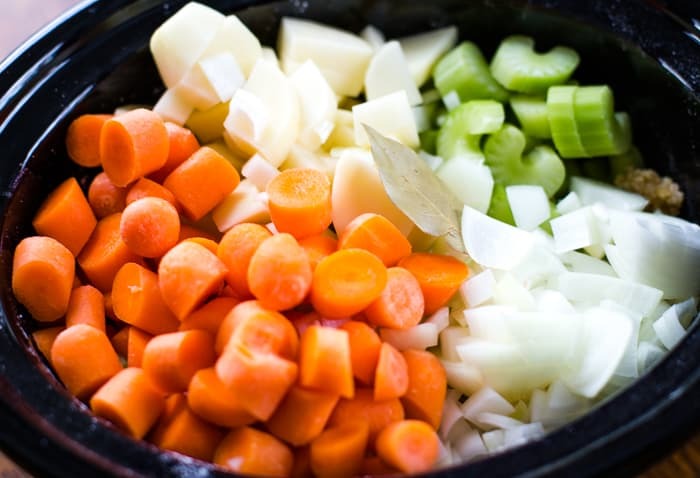 Set the slow cooker on high for 4 to 6 hours or low for 10 – 12 hours and let it work it’s magic. When the beef is fall apart tender, and the potatoes and carrots are fully cooked, you know that your stew is ready to serve. What you get, my friends is soooo good. Like, I can’t wait to make this again. 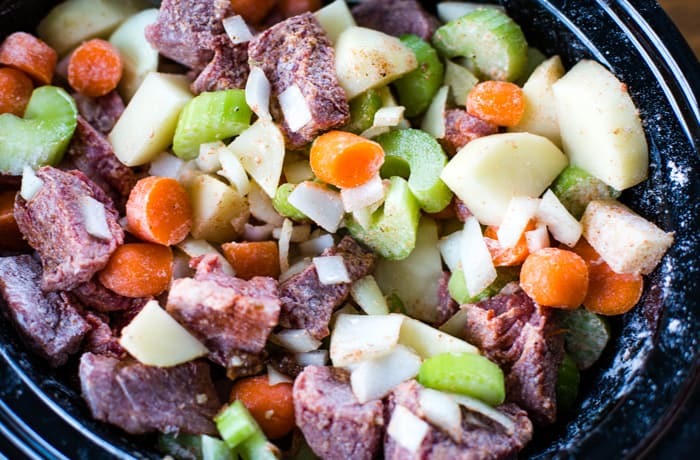 If you’re looking for that hearty and thick beef stew that’s packed with flavor. This is it. The original recipe comes from my grandma’s recipe box. It looks like she found this old fashioned beef stew recipe in the newspaper. I love a good newspaper recipe because they seem to always end in success. Who would submit only their best?! This recipe reminds me of the slow cooker mac and cheese recipe I also found in an old newspaper. 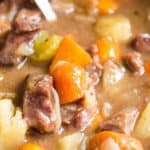 What size slow cooker do I need to make this beef stew? I used a four quart slow cooker and it was full to the max. You could use a 5 quart or 6 quart as well with no problems. Do you have to cook the meat before putting it in the slow cooker? No. 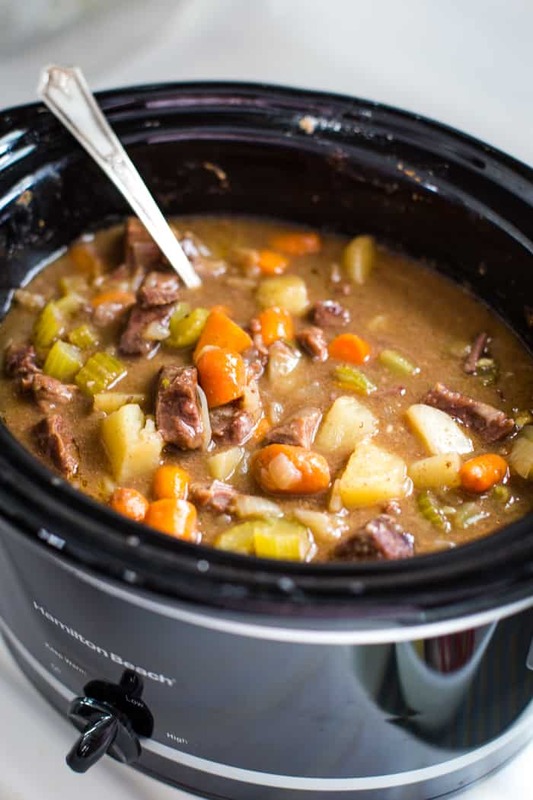 You will cut the meat into bite size cubed pieces and then add them to the remaining ingredients in the slow cooker. 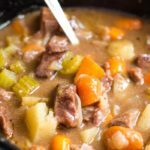 How do I thicken my slow cooker stew? Because you bathe the beef in flour before cooking, it will work it’s magic while it slow cooks to create a thick broth on it’s own. There’s no need to thicken it further. What kind of beef do you use for beef stew? I use stew meat, chuck roast, chuck shoulder, chuck-eye roast or top chuck to make my soup. I prefer chuck roast because it has enough fat to bring even more flavor to the soup. 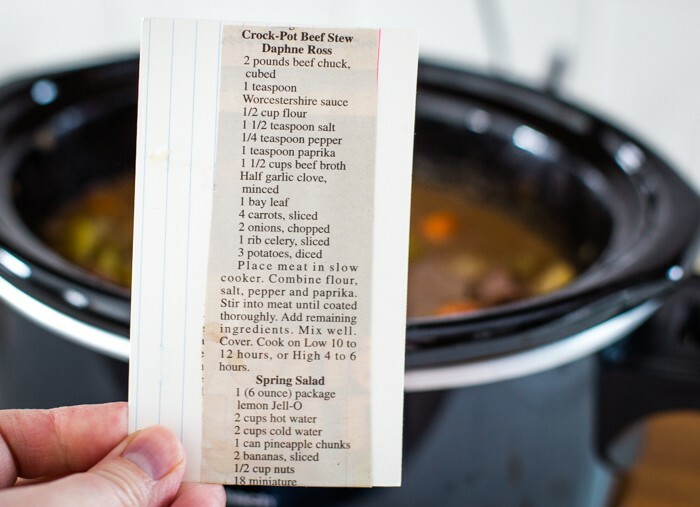 Do you have to brown the beef before cooking it in the slow cooker? No. For this recipe you do not need to brown the beef, first. If you really can’t help yourself, I would brown it after tossing it with the flour mixture. What kind of beef bouillon do you use? I only use Better Than Bouillon and I like the organic beef type because it has less fillers.